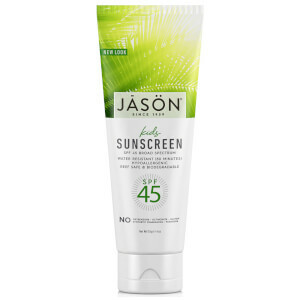 Protect your children’s skin from the sun with JASON Kid’s Sunblock SPF45. Featuring a higher SPF for additional protection against sunburn, this sunblock is oil-free and hypoallergenic, suitable for use on the most sensitive skin. Providing everyday natural care against the sun, JASON Kid’s Sunblock SPF45 protects your skin from the sun’s harmful rays. Help prevent sunburn with this sun-essential. Apply sunscreen liberally to all exposed skin areas 15-20 minutes before sun exposure. Reapply as needed after towel drying, swimming or sweating. For use on children under 6 months, consult your doctor.